Grew out of love. True to the craft. Landtmann's fine patisserie is the heart of our family business. The typical Viennese coffee house culture us Querfelds stand for, would be unimaginable without fine cakes and pastries. Our bakery is a specialty manufacturer, where traditional confectionery is a lifestyle. We grew up with love for the Viennese pastry kitchen, and always remained true to the craft. The importance of our in-house patisserie, is explained by its history. When Anita and Herbert Querfeld took Café Landtmann over in 1976, the apple strudel still came from the family kitchen. The demand was great and so a pastry chef began to bake cakes and pastries in the basement of Café Landtmann. Soon, the patisserie moved to a larger location in the second district. After our family took over the management of more coffee houses, Landtmann's fine patisserie moved to Alterlaa in 2006, where our Tortenshop Café has since been located. 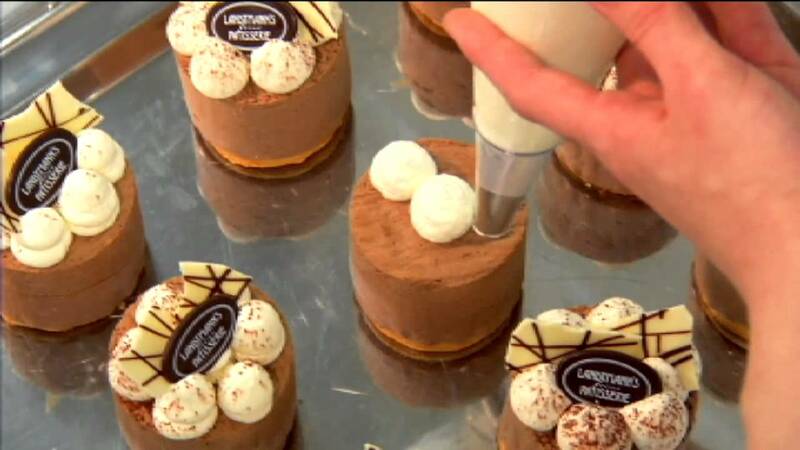 All our cakes and desserts are handmade and baked with love in Landtmann‘s fine Patisserie. Our confectioners love their handcraft and good old recipes of Viennese desserts. One does not need more than that. Do you love apple strudel? Then you have to try our original Viennese apple strudel. The Viennese original recipe's origin is our imperial bakery in Schönbrunn! Quality and variety for you. Handmade brioche, fine croissants, fresh nut croissants. Mozart cake, Esterhazy cafe, Landtmann's fine cake. All these delicacies are daily made in our bakery.